November 2004, Volume 1 Issue 11 Know It - Profit! This month I want to share my method for selecting stocks that have the best potential for profitable gains. I call it the Three Step Set-up. It's simple... we'll choose the strongest stocks from the strongest sectors based on a quarterly look back period. Let's get started! Determine the strongest stock sector. 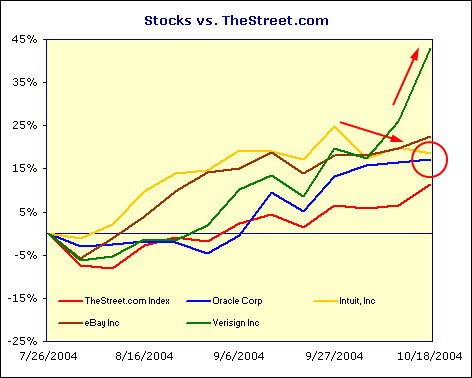 Create a relative strength comparison chart of stock indices that interest you. I chose the following indices: internet, oil, gold and real estate. 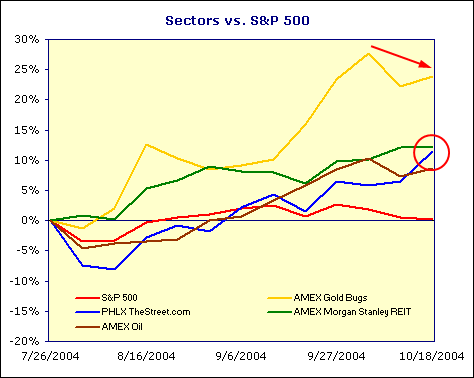 Then, I compared them against the S&P 500. Although the AMEX Gold Bugs index is the strongest, I'm not selecting it because it has already topped-out. So, I'll go with PHLX TheStreet.com Internet index... it is showing strength and still rising. Select the strongest stocks in the sector. I compared a handful of stocks from the PHLX TheStreet.com index to the index, itself. The clear front runner is Verisign Inc but, I'm not willing to step in front of a runaway train. In Step 3, I'll show you why. Intuit, Inc is strong but, appears to have topped. 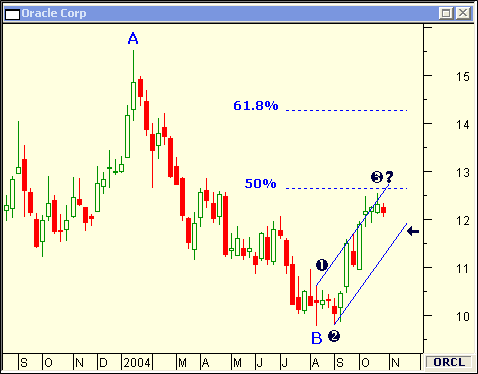 I'll select Oracle Corp for its steady, sustained growth. Apply technical analysis to determine entry and exit strategies. When a stock moves sharply in a short period of time it is known to have gone parabolic. 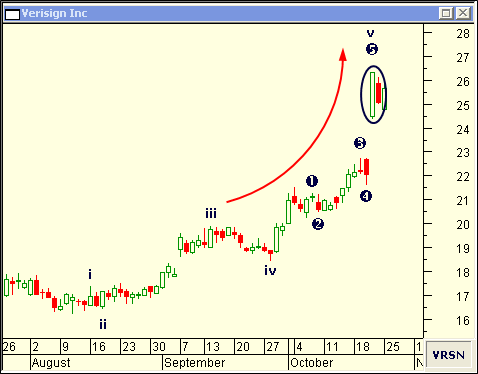 When I apply simple, non-correlated analysis it is clear there is not much upside potential left for Verisign Inc.
For example, the Elliott Wave count shows the stock has reached the end of a fifth wave, inside a fifth wave... a bearish sign. The bearish Harami candlestick pattern doesn't bode well, either. First, on this weekly chart it appears the stock has just completed a third wave, bumping into resistance at the 50 percent Fibonacci retracement of trend AB. Next, I'll wait for the price to move down to the bottom of the channel before looking for an opportunity to enter a trade on a candlestick reversal pattern. Finally, I'll use a Fibonacci extension of 61.8 percent to forecast a price target... measured from the low at point B to the end of the third wave. The Three Step Set-up is an easily deployed method that will yield solid results, time and again. I encourage you to use it to pick stocks for your portfolio.